Comment: Disc, case and artwork in excellent condition with little sign of use. May not include online digital copy. We ship in recyclable American-made mailers. 100% money-back guarantee on all orders. Julius Katchen performs the composer's work whom he most favored; again, highly-esteemed recordings among classical cognoscenti . I don't know about the other sets of BRAHMS's works for solo piano,but you can't go wrong with this one.JULIUS KATCHEN was known for his love of the music of the GERMAN composer.KATCHEN's performance on the third sonata for instance is unmatched.As for the late piano pieces,the op.116-117-118 and 119,there are many good recordings (HAKON AUSTBE is one) but again KATCHEN can equal them.Considering that these recordings are from the sixties,they remain remarkably vintage.Anyone interested in BRAHMS's piano music or who want to discover it should choose this set. CD arrived within eight days. No issues. Many thanks! Listening to the Katchen CD as I write this. Produit et service: Parfaits !! Merci !! For me, Katchen has always been the consummate Brahmsian; I owned the original vinyls housed in a nifty London slipcase set, all the records in their own jackets. So, when Decca decided to re-issue the Brahms on CD (in their two jewel boxes), I was more than thrilled. I've been "living" with Katchen's Brahms interpretations for over thirty years--- and have never tired of them. The fact is: For the most part, the totality of Katchen's vision is unparalled; he has no rival. Even the Naxos "complete" edition of Brahms (with Biret) offers no real competition. Other pianists may offer a tad more depth here or there in one piece or another, but no pianist has played Brahms.... as I believe Brahms would have performed his own piano music. And this is no small compliment to Katchen. Katchen has captured the essence of Brahms, perhaps his musical soul--- if you allow me a metaphysical moment. Not many pianists are capable of bringing to music the illusion that the composer, himself, might actually be sitting there at the keyboard. Only a meager handful of artists might come to mind. I was listening to Sonata No. 1 in C, Op. 1 this morning and was amazed at just how fresh and incredibly real his performance is. In such an early work, Brahms has already made his mark, and in Katchen's hands it springs to miraculous life. The first movement Allegro is rugged, insightful, foreshadowing the Op. 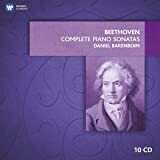 5 to come; the second movement Andante is lyrically brooding (with more than a nod to Beethoven) with a wistful quality that goes right to the heart; the impishly demonic Scherzo is daringly original, followed by a breathtaking and propulsive Finale whose glowing trio section disarms in the most unexpected way. And THAT was only Sonata No. 1 in C!!! Sonata No. 2, Op. 2, normally viewed as a lesser accomplishment, in Katchen's hands is a wonder. And Sonata No. 3, Op. 5, the rarest of Brahms' gems? It is a performance that you will return to over and over again for its power, passion and tenderness. The eight pieces that form Op. 76 run the gamut from lyrical to quirky to introverted to brusque and, for me, the best set I've ever heard. The two Rhapsodies, Op. 79, are excursions into a sound-world that seems phantasmagorical, other-worldly, wonderous. Katchen, as well, gives the Handel Variations, Op. 24 a run for their money. Hair-raising, gentle, virile. As he does the Paganini Variations, Op. 35. And the Scherzo, Op. 4? Well, just listen to what he does with this! 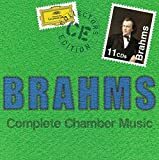 There can be no better way to immerse yourself in the piano music of Brahms, with no better interpreter of the "complete" solo works. Katchen is the rarest of talents. Oh, sure, his Brahms may have some rough edges; but, then, so did Brahms. And I think the "match" is perfect. For me, there can be no better, and I've heard an earful of Brahms. The London "sound" has come through miraculously well and much improved on the original vinyls. It is full, rich, quite present and mercifully without an intrusive amount of ambience. A flesh and blood piano.... played by an artist completely "one" with the composer. Urgently recommended. You will need no other Brahms. 5.0 out of 5 starsVehemently recommended. This box will have the width of a finger on your shelf, but will provide you with endless hours of boundless enjoyment. 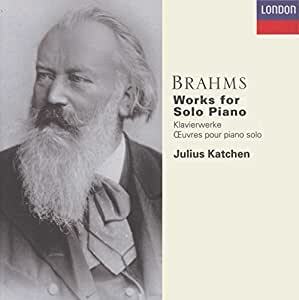 Julius Katchen not only showed that he was a master of the Brahms piano repertoire in the 1960s, but London also awarded him amazingly realistic and faithful piano recording. The transfers to 6 CDs have been totally successful, amongst the very best in London's "Collectors' Edition" series. If you have a chance to sample what's here, try the early Scherzo in Eb, Op 4, a wonderfully robust, powerful work, and the late Op 117 Intermezzi - reflective, reposeful works. You'll also find some of the brilliant sets of variations - masterpieces that are fiendishly difficult to play - and the complete sets of waltzes and Hungarian dances. The Julius Katchen's 6-disc set is a rare treat, and you are unlikely to find a more rewarding set at budget price, for there is a lot of piano works on it that are rarely recorded by other artists. If you try to find any of these works separately, there is a good chance you could spend more than you should. At Amazon's price, this is value for your money. Don't miss it! I have long enjoyed Rubenstein's recordings of the works of Brahms, and those recordings, albeit rather dated, are splendid. However, several years ago I found this collection of the complete Brahms piano pieces by Julius Katchen, and I was completely taken. There is a level of consistency with one performer, and Katchen's accuracy and stunning technique makes this a collection which will add to anyone's collection of recordings. In addition, the packaging (with individual envelopes for each cd, and each with its own discography) is very convenient. The box of 6 CD's replaces the originally released set of two jewel cases, a very good replacement I believe. I highly recommend this CD set. Although I don't consider myself an "expert" of classical music, I do listen to alot of it and own over 500 classical cd's. Out of my entire collection, if I had to throw away 499 of them and only keep one, I'd keep this box set. Katchen plays so beautifully that I lose myself in the music every time and never get tired of listening to it. If you are considering buying this and are reading the reviews for informaton, don't hesitate - buy it NOW! You won't regret it.